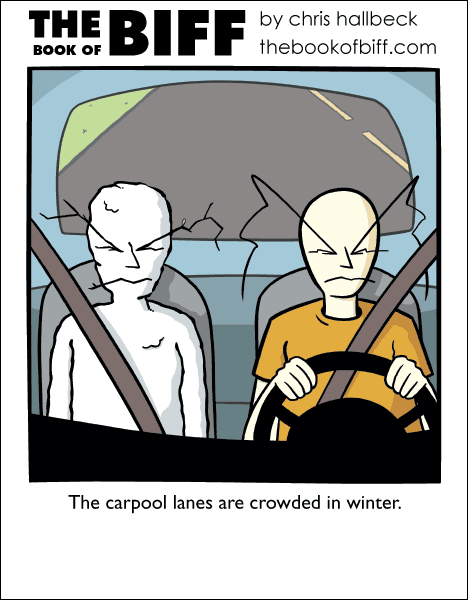 The “carpool” lane was a term I heard a bunch of times as a kid before I found out what it meant. I assumed it had something to do with swimming pools. Were the cars driving into a pool? Like a big communal car wash? Did they have pools inside the cars? It was also mentioned a lot in reference to California and that just reinforced my thinking of hot weather and swimming pools. Chris, how come the roadside is green in the winter, yet there’s snow sufficient to create a snowman? BIFF LIVES IN THE MOUNTAINS! I KNEW IT! Nope. Typical Biff over-powered A/C in the car. There wasn’t much snow. He used it all. Biff, you are a genius. Turn down the air conditioning. You’re freezing your passenger. I like how you put cheating in the tags. Back in my childhood, there was a PSA for carpooling that used Noah’s Ark as the ultimate example.